If anyone has been wondering where I went lately...I smile a little wistful smile...and say, "...far away." In my mind's eye, I went far far away...to a dreamy little farm tucked into the undulating hills of Tuscany, Italy. 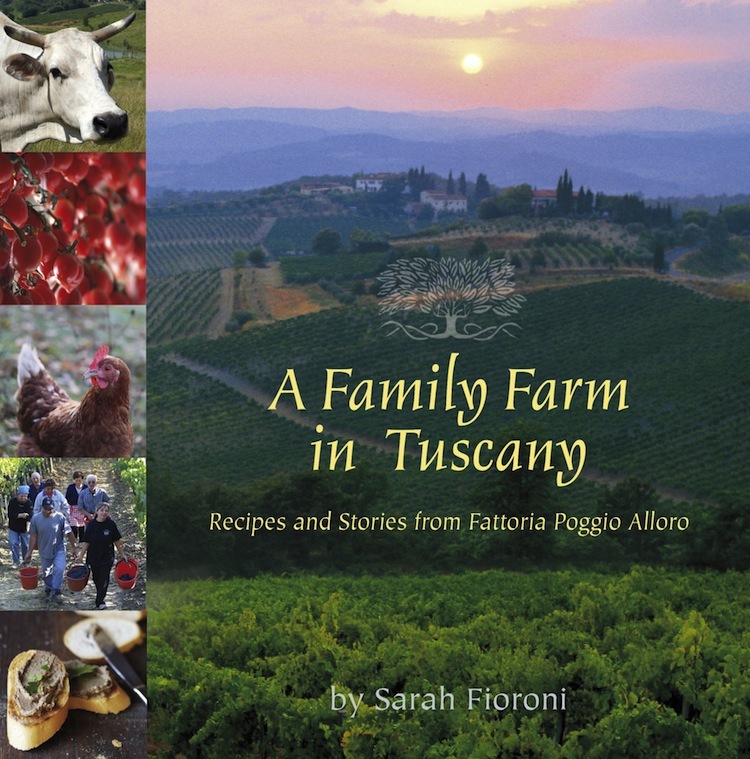 Rarely have I been so transported by a new cookbook find than "A Family Farm in Tuscany" by Sarah Fioroni. At times, as I became lost in the pages of this wonderful Italian cookbook...I forgot that it was a cookbook. Sarah has a literary voice that whispers family stories and weaves them into the spring, fall, and winter seasons of their every day farm life. I was absolutely transported to the very beginnings of the family's farming history as they toiled and tilled the soil trying to scrape by and make a life for themselves and their children as the Germans swept through during World War II. I cheered for the family when their grapevines finally yielded a good selection of grapes and they began to produce high quality wines. I imagined being at their big wooden kitchen table, at the end of a long hard day out in the fields, in front of their enormous fireplace while being served platters of pasta made from the durum wheat that they process in their mill. Through the pages of this cookbook and Sarah's family stories, I could easily imagine standing on their hillside, peering off into the distance and seeing San Gimignano nestled on the horizon. Perhaps if I were at the farm, we would need to take a little car trip down there for provisions and then to meander the ancient stone streets of this little Italian village with its striking towers silhouetted against the horizon. 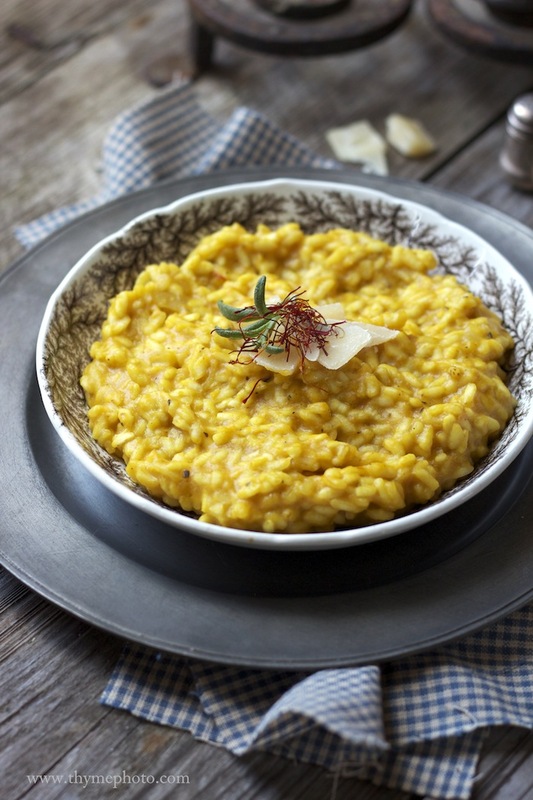 Risotto has been on my list of Italian dishes that I wanted to attempt and when I flipped to page 207, lost in the every day tasks on the farm, and saw her "Autumn Risotto with Pumpkin and Saffron", I knew that this was the inspiration that I needed to make it. 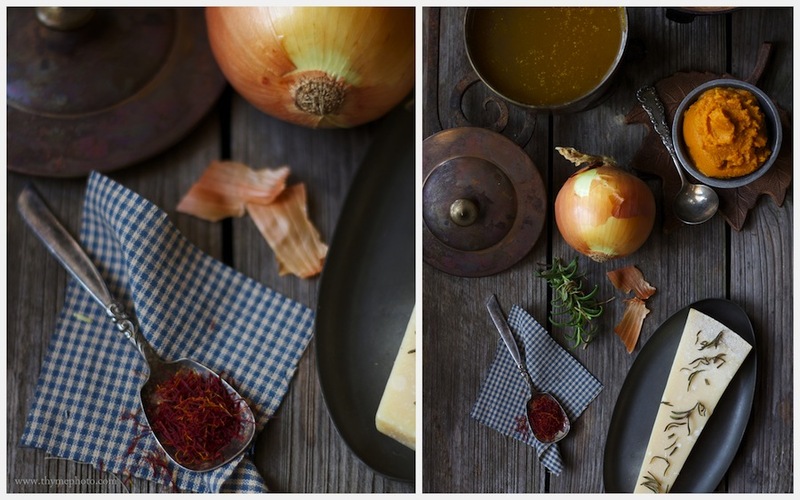 I longingly studied the photos of Sarah's Italian farm life during the autumn months. This is when the saffron flowers begin to send up their blossoms. 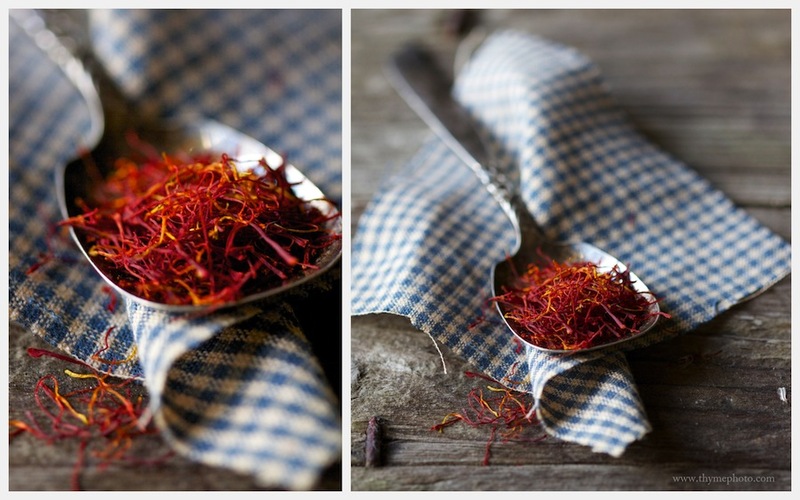 I would love to slip into a wooden chair at Sarah's table full of workers, perhaps with a little cup of espresso nearby, and pluck the petite threads of saffron from the pretty purple flowers. I winced and frowned when I read the passage about the family losing their centuries old olive trees in the 1920's and then again in the 1950's. The family painstakingly planted and waited for more trees to grow and finally flourish enough to produce olives. I would hold one of their olive bottles in my hand and sense the history, pain, and work that went into producing this wonderful cooking oil. In my imaginative trip through Sarah's alluring cookbook, through her rambling farm, called Fattoria Poggio Alloro, I would visit in the month of September to see the olives ripen and turn from a green to a dark purple. This would be when the vineyards would be full of leaves all turning reds and golds as the gusty winds begin to blow over the Tuscan hillsides. 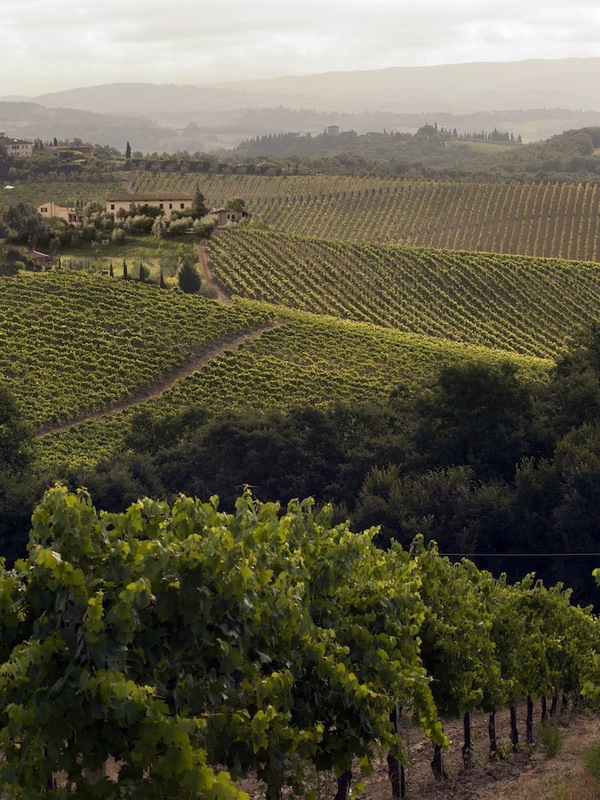 Seeing San Gimignano over the undulating fields full of leafy vines would be a beautiful sight. December would also be a fascinating time see the changes happening on the farm. Sarah's family and staff busily prepare gift baskets filled with the fruits of their labor. How incredible to hold a gift basket full of bottles of olive oil, honey, bags of pasta, and bottles of wine, all coming from the farm. Sarah moves on to describe their dreamy Italian Christmas traditions. The family's holiday menu sounds delicious, steeped in tradition, and quite different from the American menu. The "chicken liver crostinis" sound wonderful and rich. I would also be so intrigued to sample their "homemade tortellini in capon broth". Late in the day, bellies full of homemade dishes, the visions of the family all hunkering down and nestling together in front of their voluminous fireplace, sipping "vin santo" (of course, made on the farm) and dipping into it "biscotti di Prato" makes my heart go pitter patter as I realize how steeped in history these occasions are for the Fioroni family. Speaking of sweet treats and small gifts, I enjoyed reading through this cookbook so much that I would like to gift a copy of "A Family Farm in Tuscany" to one of the lovely friends who comment here on "thyme". If any of you are thinking of Christmas ideas for loved ones, perhaps this cookbook would be a good option. If you think so, either leave a comment below, or it can be purchased here. One Christmas activity so foreign to many Americans is the "roasting of chestnuts". Sarah talks about the wonderful smoky aroma of the chestnuts as they crack open from the heat of the fire. I've never grown up eating roasted chestnuts and have certainly never tried one right off of the fire! Just reading through her descriptions of delight in this annual activity made me want to give it a try. So I hope you will leave a comment below to be selected for this cookbook gift. Perhaps, you could tell me if you have ever stayed at a family farm in Italy or anywhere else in the world! I will collect all of your adventures and dream of what they must have been like. But, the holiday spirit has crept up on me and I sure would love to gift this sweet little cookbook to a reader who enjoys my southern spot called "thyme". 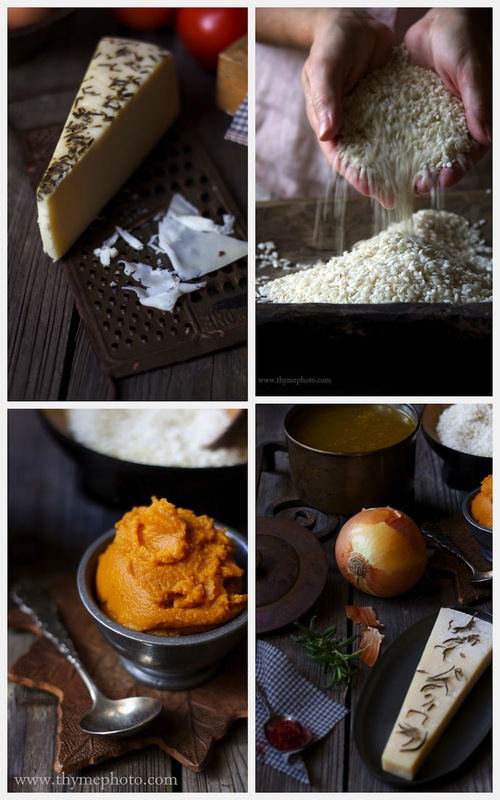 Also, there is a World Blog Tour that is also smitten with Sarah's cookbook. 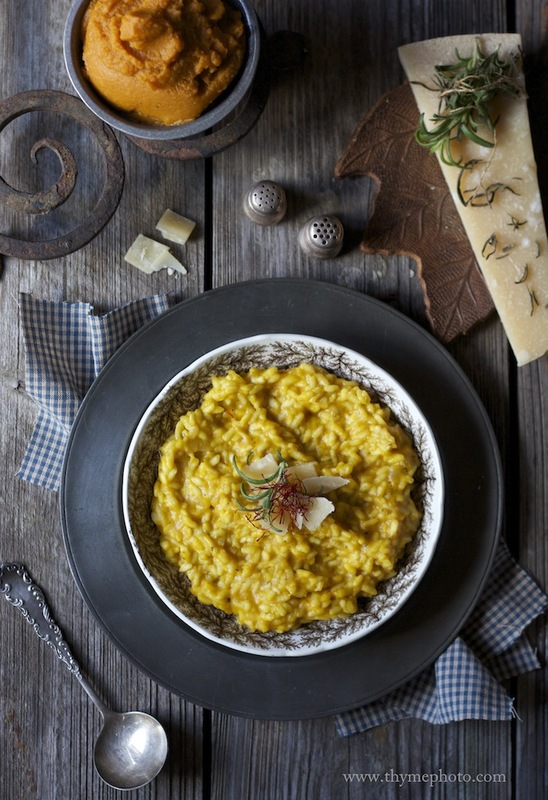 If you would like to see what other bloggers have sampled from her kitchen, Visit Cooking With Chopin, Living With Elmo October 29th through November 2nd for a World Tour Blog Hop featuring recipes from A Family Farm in Tuscany. Heat the olive oil in a heavy-bottomed, 14-inch (35 cm) saute pan over medium heat. When oil is hot, add the onion and cook, stirring occasionally, until onion is wilted and transparent, about 5 minutes. Add the pumpkin (if uncooked) and season with salt and pepper. Cook for 15-20 minutes. If the pumpkin starts to stick to the pot, add some of the hot water. Add the rosemary and sauté until the pumpkin begins to soften. 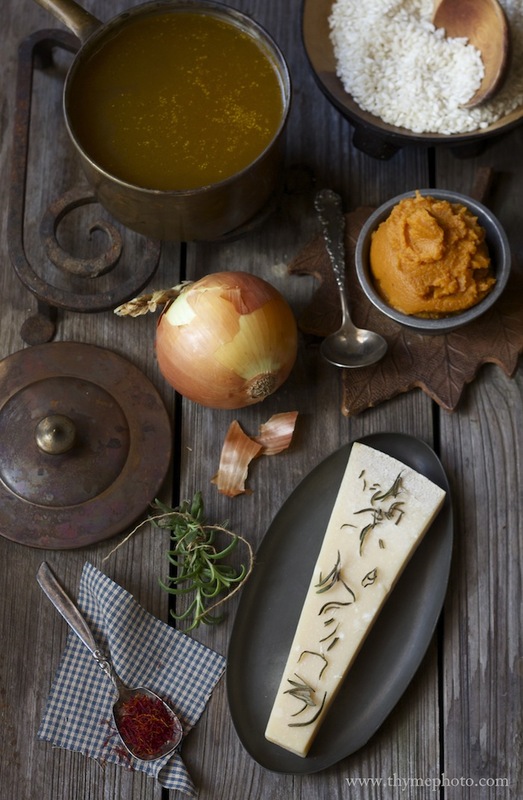 While the pumpkin mixture is cooking, combine 1/2 cup (120 ml) of the water with the vegetable broth and saffron in a heavy-bottomed sauce pan; cook over medium heat about 10 minutes. Set aside and keep warm. Add the rice to the pumpkin mixture and sauté for 2 or 3 minutes. Add one-third of the vegetable broth mixture, reduce heat to medium, and cook, stirring, until rice absorbs the broth. Now add 1/2 cup (120 ml) of water, and cook, stirring, until it is absorbed. Continue to add broth and water alternatively, cooking and stirring, allowing the rice to absorb the liquid between each addition. 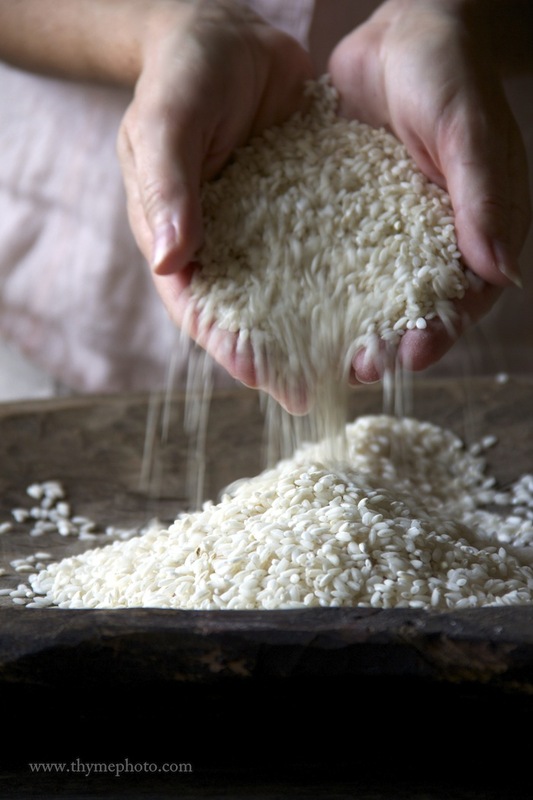 When the rice becomes creamy, add the broth and water more sparingly, or the rice will become mushy. 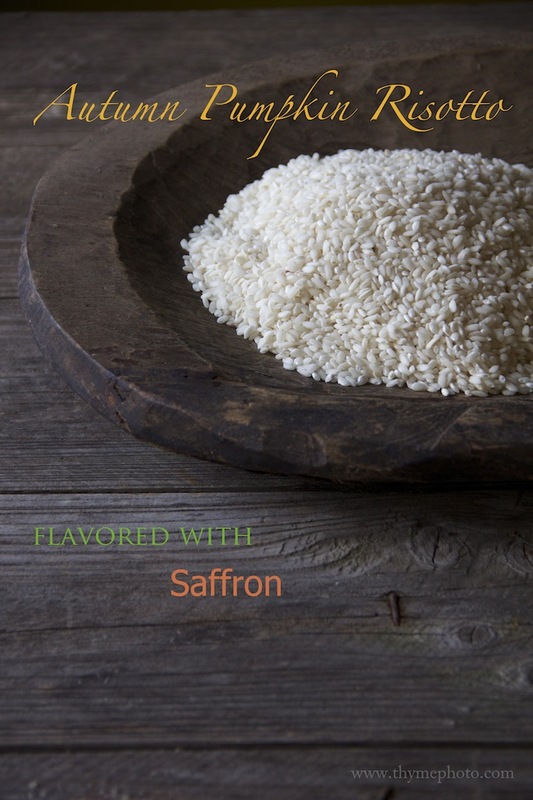 Cook until rice is creamy but still al dente, about 25 to 30 minutes total). Stir in the butter and scatter a little Parmesan cheese over the top.